The obverse is emblazoned with the coat of arms of Peru, which is represented with Peruvian symbols, such as the national animal of Peru, the llama-like Vicuña (the South American version of a camel). To the right is the Peruvian national tree (a quina tree), and below is a cornucopia overflowing with coins, symbolizing Peru’s great wealth of precious metals. 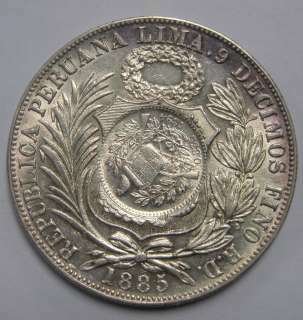 On the outer periphery are the words "REPUBLICA PERUANA" and "LIMA" (for the Lima Mint). Peruvian Seated Libertad (Liberty) Sol (Sun). 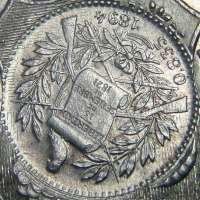 The reverse features a seated Lady Liberty holding a scepter topped by a Liberty Cap and a shield emblazoned with a radiant sun. In front of Liberty is a column topped with a wreath and wrapped with a ribbon on which is written the word “LIBERTAD”. On the upper outer periphery is the motto "FIRME Y FELIZ POR LA UNION" or "Steady and happy for the union". On the lower outer periphery is the denomination "UN SOL". 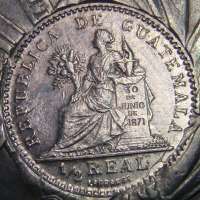 Sitting Liberty to the left with cornucopia filled with flowers in the other hand a balance leaning on a column with 30 DE JUNIO DE 1871 on it around REPUBLICA DE GUATAMALA bottom 1/2 PESO stamped on a peso of Peru Sitting Liberty to the right holding Liberty cap and in the other hand a shield, behind on the right side a column with a wreath on it, tossed around the column a band with LIBER TAD incuse on it FIRME Y FELIZ POR LA UNION bottom UN SOL. 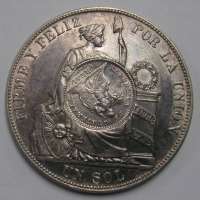 Letter with LIBERTAD 15 DE SETIEMBRE DE 1821 on it between branches behind it to guns and crossing swords on top sitting Quetzal to the left bottom 0,368 1894 stamped on 1 peso of Peru Shield of Peru between branches on top a wreath, REPUBLICA PERUANA LIMA 9 DECIMOS FINO letters of the mint, bottom year. It has been counterstamped ½ Real Guatemala, exergue 1894, Krause catalog number KM#165. By 1894, foreign coins had become so prevalent that on August 10, 1894 the government authorised their counter-stamping at the mint, with the official ½ Real dies of 1894, to legitimize their circulation. Engraver was Jean Lagrange (countermark). The letter(s) following the dates of Peruvian coins are the assayer's initials appearing on the coins. They generally appear at the 11 o'clock on the colonial coinage and at the 5 o'clock position along the rim on the obverse or reverse on the republican coinage. For this coin, the assayer initial is R.D. Krause KM#196.22 Type X; Santiago Mint. Libertad incuse. Many minor die varieties exist. I got one Sol today minted 1871 initials YJ , I thought Guatemsla started stamping 1885 ? Anything notable ?